Oh, and I have a Beatles tie. Did I mention The Beatles tie? Sometimes it is hard to remember that The Beatles were human. People throw terms like “rock gods” around all the time, but in their case it makes sense. The impact they have had on our culture is extraordinary, like a kind of overpowering movement. And while I can say I have seen Sir Paul twice in concert there was something still god-like about him as he stood towering over us on giant stadium-sized screens for three hours…. If he had said “amen” at any time during those shows, we certainly all would have repeated it after him. Oh, and he called forth fireworks during his performance. Religions were started for less a spectacle than that in the past. Bigger than Jesus, John? Well, for some of us you don’t need to get bigger, equalling is just fine. Yet, as I get older, I am drawn more and more to stories and documentaries that show the other side of The Beatles, the human side. Which is probably the reason I love the new and very personal documentary Good Ol’ Freda so much. Freda was The Beatles’ personal secretary for 11 years, from before their rise to the end of the band. She oversaw their fan club and ran the responses that people would receive. Yes, she was the one that would collect George’s hair from a barber if a fan requested it. Freda was more than just simply in the background. She was friends with each of them (they would give her rides home from time to time and she hints that some of them may have been “more than friends”) and was there at many of the big moments in The Beatles’ career. The time of The Beatles is her story as well and few are still around that can claim that honor. What adds a particularly human side to this story is the relationship she had with the people around The Beatles; for example, their parents. She went dancing with George Harrison’s dad. Had tea with Ringo’s mom once a week. And went out drinking with Paul’s dad. 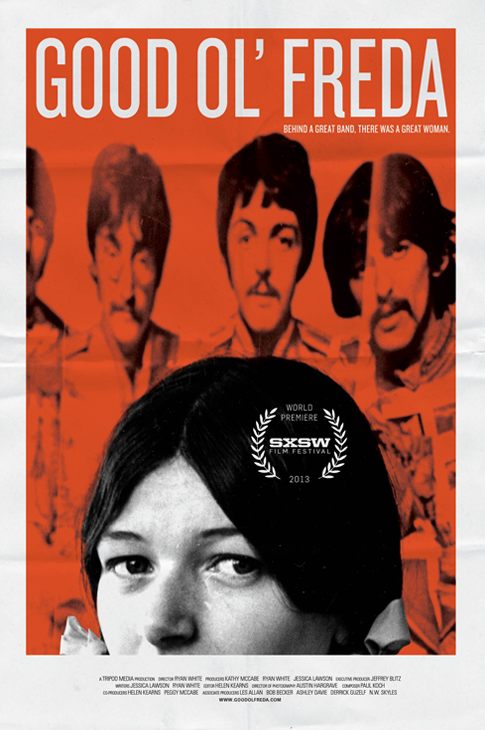 Seeing pictures and hearing stories about their relationship with their parents added a level to The Beatles mythology that only has really been hinted at before in documentaries. They were kids once, and probably had diapers that needed to be changed. Good Ol’ Freda is full of fun stories that is like a fine meal for a Beatles fan, from her taking Ringo to the hospital for the birth of his first child to dealing with John’s teasing… and able to give back just as well as he dished out. Impressive. Honestly, by this point, I felt I had seen all of the pictures out there of The Beatles, but this show was filled with new images, many times showing a very personal and (there’s that word again) human side to those four incredible lads from Liverpool. Oh, and she was on the freaking Magical Mystery Tour bus… many times sitting next to Ringo. Probably the thing I walked away with the most from the documentary was an admiration for Freda herself. She never sought out fame or fortune from her relationship with the lads. She even still works as a secretary! There are no scandalous books in her past trying to cash in (Like Peter Brown, for example). She even justifies the documentary in it by saying that she didn’t want the stories lost. She wanted her grandkids to know what she did before they were born. See, it is not about money. It was never about money for her. There is a lot of private stuff that Freda still won’t share (for example one question I have is why she gave so much of her Beatles stuff away in 1974, why that year?). Even the one time she questioned a decision The Beatles made in their career (Paul rushing the group forward after Brian Epstein’s death), she seems to almost state this opinion in an embarrassed fashion. Just like her favorite band she is human too. When this movie comes out on DVD, it will be added to my library. I see it happily going right next to the Anthology boxset, either next to Paul McCartney’s Wingspan or Martin Scorsese documentary on George (Living in the Material World), but unlike most of those I can see myself watching this many, many more times. Freda was a friend of The Beatles and by the end she will feel like one of your’s as well. This entry was posted in Film and tagged Abbey Road, Beatles, Brian Epstein, Documentary, Freda, Good Ol' Freda, John Lennon, Living in the Material World, Magical Mystery Tour, Martin Scorsese, Movie Review, Paul McCartney, Ringo, Rock Band by Scott D. Southard. Bookmark the permalink. Okay, I’ve got a Beatles nut question for you–where is the best place to sell Beatles merchandise? I know someone who is looking to unload an unopened numbered pressing of “Reel Music”. Many times there are conventions around Beatles stuff. I attended one in London for example (Got a John Lennon sailor hat), but that was years ago. I would recommend going that route. Doing some googling around Beatles or Rock memorabilia conventions and then see about getting a table. Those attending will be the ones most interested in paying top dollar. Grab a copy of Abbey Road and the White Album… No, I’m serious. It is an assignment. Both of those albums show the expanse of their creativity. They are much more than the three-minute pop song. They were artists evolving called on vinyl.